So you’ve decided to remodel your home? We’re assuming that you already know the work that lays ahead and the decisions you will need to make. Among those decisions, one of them is more than likely choosing bathroom and kitchen cabinetry. You have plenty of options, to say the least. Home improvement stores are full of them, and while they may offer a variety of styles and finishes to choose from, none of those cabinets compare to Rinehart Design Group’s custom kitchen cabinet designs. 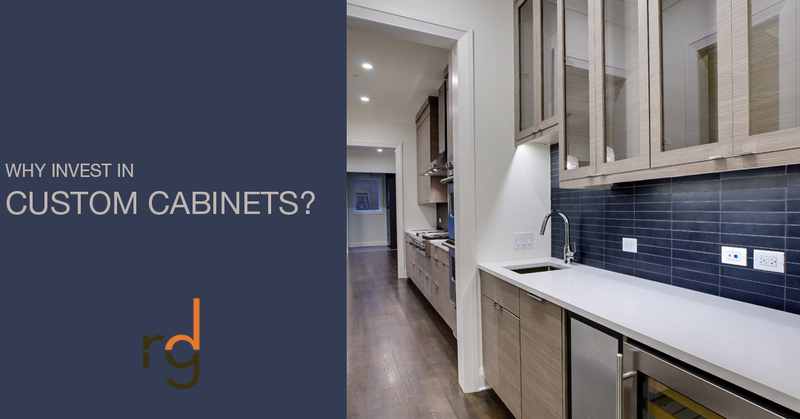 If you’re at the point in your kitchen remodel to decide on your cabinetry, we’re here to help you learn why custom cabinets is the way to go! Sure, the big box home improvement stores will provide you options for kitchen cabinets, but they are limited. Semi-custom lines offer a basic line of color options and glazes to choose from. Rinehart Design Group takes into consideration the entire room’s design and your personal preferences from color, materials, finishes, glazes, accents, and more. Truly, your cabinetry options are limitless. Some kitchen spaces are unique sizes and require specific cabinets in order to fit those quirky corners. The cabinets you order from a hardware store are factory made and don’t allow for a lot of flexibility. Custom cabinetry on the other hand is more accommodating to your lifestyle and your home. You can build to any width, depth, and height. Essentially, you can have cabinets to fill every inch of your kitchen if you desired! Rinehart Design Group prides ourselves on the highest level of quality made cabinets. Every cabinet and cabinet door is made in our very own studio with a keen attention to detail. We introduce durability and quality so your cabinets can last longer. Rinehart Design Group only uses the best wood and materials to ensure that your cabinets are not only beautiful, but they’re built to last. Modern kitchen cabinets have very little accessories and aim for a clean appearance. While other kitchen cabinets have beautiful accessories and accents to complete the overall look you are seeking. Custom cabinets can achieve the design you are after, whereas semi-custom cabinets may only offer a few choices to choose from. Who doesn’t want to add value to their home? Perhaps the reason you are remodeling your home in the first place is to increase your home’s worth and put it on the market. In which case, a beautifully designed kitchen won’t be nearly as valuable with factory produced cabinets. Believe it or not, but buyers know the difference. Especially the buyers that are looking for custom or renovated kitchens. Afterall, a kitchen is a major selling point when a house goes on the market. At Rinehart Design Group, our custom cabinetry is our calling, however, we also love everything about interior design and turning a house into a dream home. Whether you are planning on complete renovation and remodeling every room of the house, or you are an architect seeking the best cabinetry to put the finishing touches on the home—we are exactly who you want to call. We promise to provide every one of our clients truly unique and one of a kind cabinets that are guaranteed nowhere to be found at any big box store. Our team of designers will work closely with you throughout the design process. From taking measurements to selecting the type of wood, and finding the perfect accessories, you can count on Rinehart Design Group to build the kitchen cabinets of your dreams. We service Illinois, Wisconsin, Georgia, and North Carolina with our main facility in Atlanta, we are proud to offer these cities access to our renowned cabinets. Rinehart Design Group is known for quality craftsmanship and superior design. So if you’re located in Atlanta and you’re seeking quality kitchen cabinets to complete your kitchen remodel, look no further than Rinehart Design Group. We’re excited to work with you and introduce you to the stunning cabinets we have mastered for over 21 years. Be sure to visit our site and view our online gallery, and contact us to get started today!